Here’s something to ponder as much of the U.S. digs out from under one of the biggest snow storms in decades. Here’s an amusing article from 11 years ago. If you follow the link titled “Don’t Believe the Hype over Climate Headlines,” you can see The Independent furiously backpedaling over this preposterous article. Read the rest at The Independent. If you scoff and say anthropogenic global warming is a crock, watch out! The global warming inquisition might come after you! LONDON — Apocalyptic visions and the muscular language of religious fervor are invading the climate arena, replacing issues of fact with those of faith and bringing high emotion into science — an area where it should have no place — politicians and religious leaders complain. Double-speak doesn’t get any better than this! Isn’t it interesting that the story says Jackson reasserted her “faith”? Is that what science is about? Faith? Or is faith–dare I ask–what cults are about? 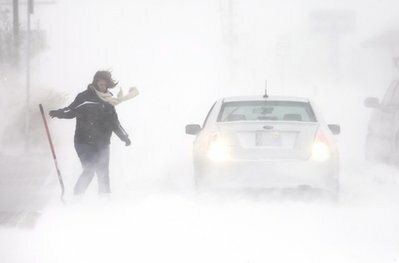 Those still caught up in the religion of Global Warming will now ditch Phil Jones and continue to insist that the carbon dioxide we produce is warming the earth—even as they shovel themselves out of the worst global snowstorm in memory.